Copyright 2013. No portion of this website is to be reproduced without written permission of Kustom Ink Australia. Choppertown Twin-Pack: Buy "The Sinners" & "From The Vault". Just AU$55 - Save AU$5! "Choppertown: The Sinners" is the award winning documentary, by Scott Di Lalla and Zach Coffman, that captured a moment in time like no other. 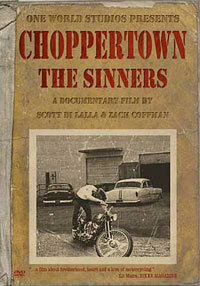 Choppertown is the world's first motorcycle documentary about the renowned hot rod and motorcycle club, the Sinners. Modern day greasers, the Sinners are all about the old school. None of them are old enough to have experienced the hot rod heydays of the 50s and 60s, but still they live on the edge of society chopping cars and bikes and searching for vintage parts to make their hot rod, triumphs, Mercs and bobbers into rolling works of art. Running time: 93 minutes, plus bonus clips and 12 page full-colour booklet. Price: AU$30 each, including postage (Australia ONLY). Available since: 14th November, 2006. Choppertown: From The Vault is the essential companion DVD built from the unseen footage from the original shoot. "Music to Wrench By" CD Soundtrack included! Running time: Two hours of ALL NEW scenes with even more riding, wrenching and killer music.